Technically the storm will begin tonight as scattered light snow, sleet, or freezing rain. This may not amount to much and could fade to a list mist or drizzle. A lull in the action will occur Wednesday into early Thursday morning. The main event intensifies mid-day Thursday with heaviest snow, sleet, and freezing rain falling between 6AM to 6PM Thursday. Precipitation will end by the late afternoon across southern Wisconsin. Light snow continues until midnight over the northern half of the state. Heavy snow accumulation of 10-15" is expected across far north-central Wisconsin and Upper Peninsula of Michigan falling almost entirely on Thursday. 6-10" across northwest and central Wisconsin. Snowfall rates could reach 1-2"/hr. 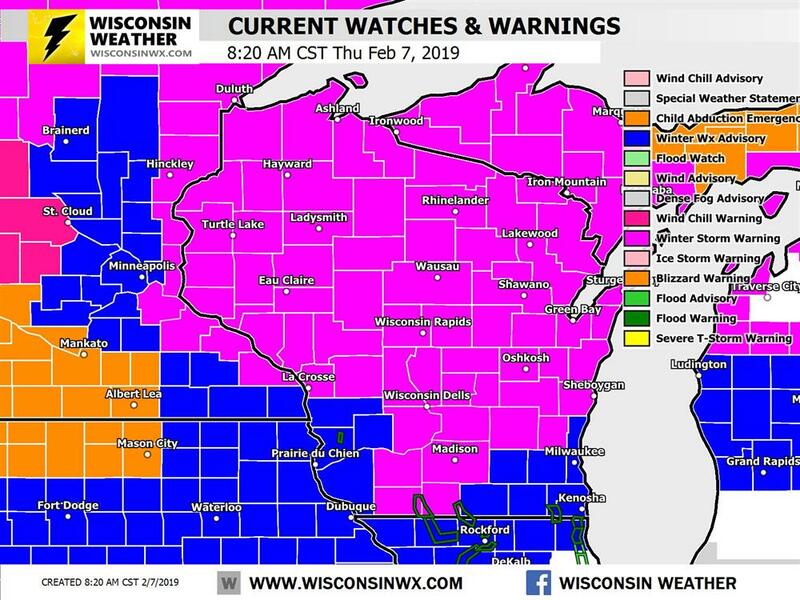 Snow will mix with sleet and freezing rain across southwest, central, and northeast Wisconsin lowering total snow accumulation. I reduced snow totals in and south of Minneapolis area as latest QPF simulations and historical analysis suggest it will be challenging (not impossible) to reach 6". Much better chances in northwest Wisconsin. I think lake enhancement will help boost totals along Lake Superior in upper Michigan. 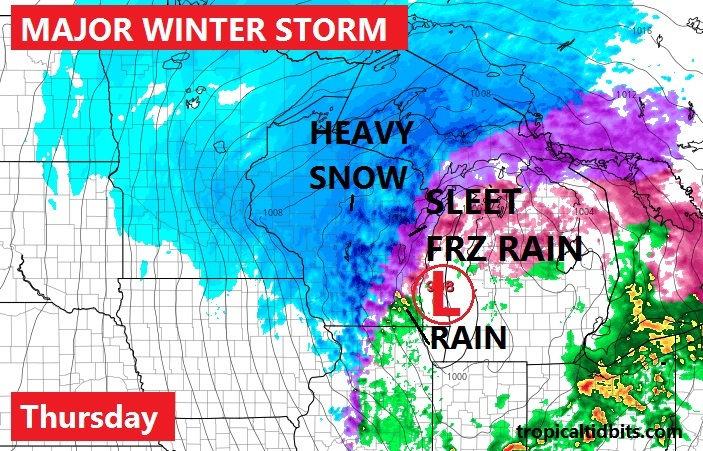 There is a little uncertainty as to how far east the heaviest snows will get across northeast Wisconsin and upper Michigan. Heavy snow will fall with 10-15 inches across far north-central Wisconsin and upper Peninsula of Michigan by midnight Thursday. Sleet and freezing rain is expected Thursday. Ice accumulations up to 0.25" and/or sleet accumulations up to 0.5" may lead to slippery travel conditions especially on untreated roads. Generally east of a Praire du Chien to Marinette line. 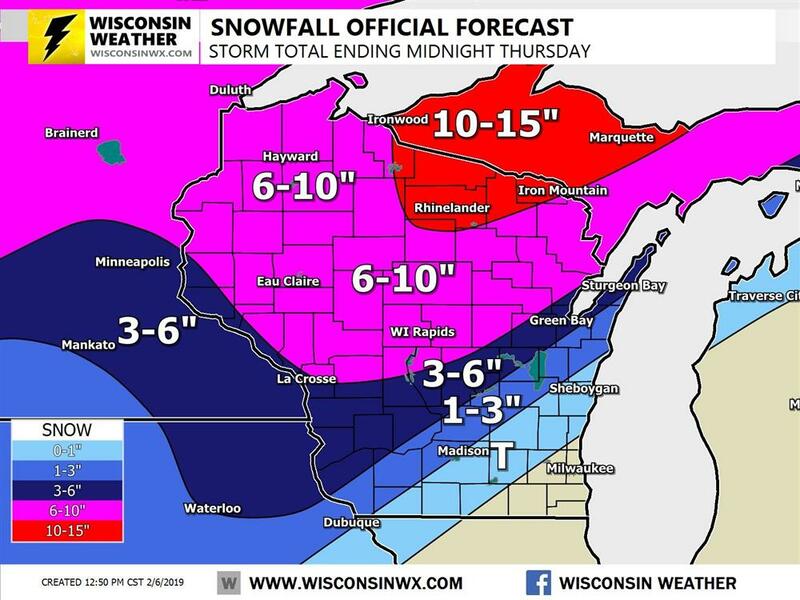 I think the worst will be from Madison to Manitowoc. Freezing rain amounts may need to be increased locally as things evolve. Will be watching closely. 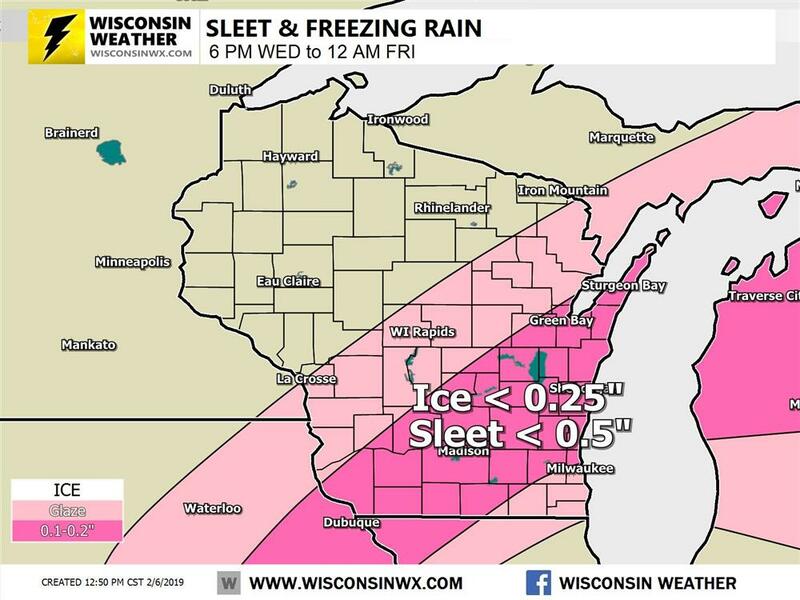 Freezing rain and sleet is expected Thursday across southern and eastern Wisconsin. Ice accumulations up to one quarter inch and sleet up to one half inch. For most of the state wind gusts of 25-35 MPH will be common both Thursday night and Friday. Wind gusts will increase as the storm ends reaching the 35-45 MPH range in southern Wisconsin. Strongest gusts may occur on the high points near the lake Michigan shoreline including the Niagara Escarpment. On Thursday winds will be weaker, generally less than 30 MPH. 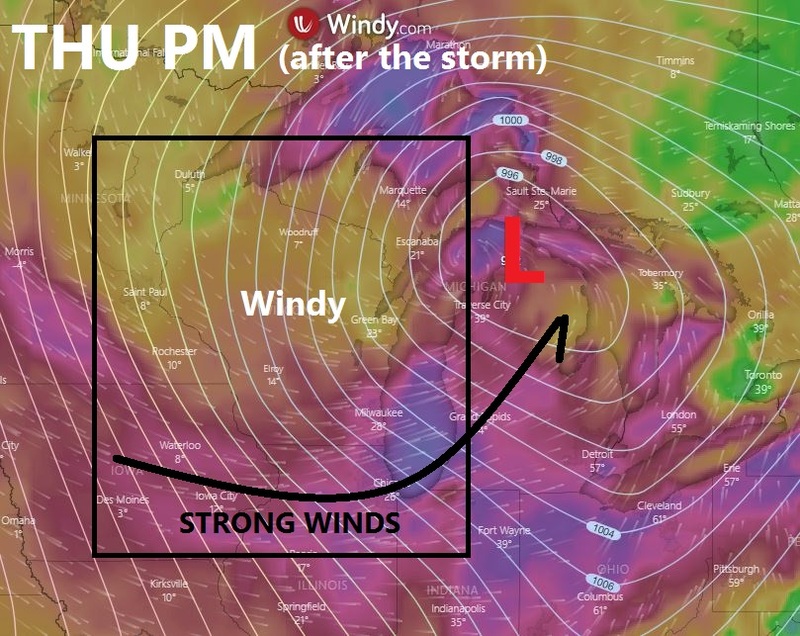 As the storm ends winds will increase and blowing and drifting occur Thursday night into Friday. Strong westerly winds gusting up to 35 MPH (stronger south). This will make travel challenging across northern Wisconsin and the upper Peninsula of Michigan into Friday. NEXT UPDATE - No forecast changes or updates are expected. Please check out our facebook page for the latest information! We operate independently. Unless otherwise stated; our snow maps are created by hand daily by either myself or one of our expert Wisconsin storm chasers. These predictions are based 100% on our personal interpretation of hundreds of model forecast simulations and gut feeling. I attempt to smooth out the changes and variability to give you the cleanest and most accurate prediction for the entire region. Each detail is considered and carefully thought out. We also create our own daily thunderstorm outlooks and heavy rain forecasts in the summer so please check back in spring if thunderstorms are more your thing!